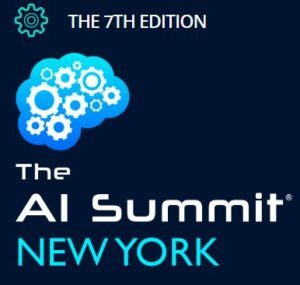 This week, business, technology, and academic thought leaders in Artificial Intelligence are gathered at The AI Summit in New York City, one of the premier international conferences offered for AI professionals. Below, I consider two of the three takeaways from Summit Day 1, published yesterday by AI Business, from the perspective of lawyers looking for opportunities in the burgeoning AI market. If a year from now your law practice has not fielded at least one query from a client about AI technologies, you are probably going out of your way to avoid the subject. It is almost universally accepted that AI technologies in one form or another will impact nearly every industry. Based on recently-published salary data, the industries most active in AI are tech (think Facebook, Amazon, Alphabet, Microsoft, Netflix, and many others), financial services (banks and financial technology companies or “fintech”), and computer infrastructure (Amazon, Nvidia, Intel, IBM, and many others; in areas such as chips for growing computational speed and throughput, and cloud computing for big data storage needs). Of course, other industries are also seeing plenty of AI development. The automotive industry, for example, has already begun adopting machine learning, computer vision, and other AI technologies for autonomous vehicles. The robotics and chatbot industries have seen great strides lately, both in terms of humanoid robotic development, and consumer-machine interaction products such as stationary and mobile digital assistants (e.g., personal robotic assistants, as well as utility devices like autonomous vacuums). And of course the software as a service industry, which leverages information from a company’s own data, such as human resources data, process data, healthcare data, etc., seems to offers new software solutions to improve efficiencies every day. All of this will translate into consumer adoption of specific AI technologies, which is reported to already be at 10% and growing. The fast pace of technology development and adoption may translate into new business opportunities for lawyers, especially for those who invest time to learning about AI technologies. After all, as in any area of law, understanding the challenges facing clients is essential for developing appropriate legal strategies, as well as for targeting business development resources. Adapt or be left behind is a cautionary tale, but one with plenty of evidence demonstrating that it holds true in many situations. Lawyers and law firms as an institution are generally slow to change, often because things that disrupt the status quo are viewed through a cautionary lens. This is not surprising, given that a lawyer’s work often involves thoughtful spotting of potential risks, and finding ways to address those risks. A fast-changing business landscape racing to keep up with the latest in AI technologies may be seen as inherently risky, especially in the absence of targeted laws and regulations providing guidance, as is the case today in the AI industry. Even so, exploring how to adapt one’s law practice to a world filled with AI technologies should be near the top of every lawyer’s list of things to consider for 2018.